We humans are notoriously bad at judging how much we eat. Studies show that we always underestimate it. We are hard-wired to do so by our biology. But the survival mechanisms that worked for our distant ancestors don’t apply in modern Western societies where food is abundant. So don’t trust your mind to guess and remember all the carbs you eat. It will fail – and so will your diet. Always look up the exact carb counts. Check the labels on packaged foods. For fresh whole foods, weigh them exactly and look up their nutritional values. Use an app, a food diary or just plain old pen and paper to record everything. This sounds like a lot of work. But after several weeks, you will know the counts for all your favourite foods. Then you could relax the counting a bit – provided your diet is working. If you run into any problems with your diet, like a weight loss plateau or extreme fatigue, always go back to super-diligent checking of your intake of carbs. Did you know Google can give you nutritional summary for most whole foods? Just google the name of the foods plus the term “carbohydrates” and you will get the answer, plus a panel with all the key nutritional data included. Google uses USA model of total carbs including fibre. So if you need to get the net carbs figure, just subtract fibre from the total carbs. You can access the official nutritional database from US Department of Agriculture online. It mostly includes whole foods, plus a few popular food brands. Net carbs are not provided, so you will need to use the formula “Total Carbs – Fibre = Net Carbs” to calculate. 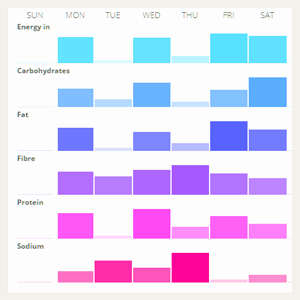 This nutrition tracking website also uses USDA data, but the interface is a bit more user-friendly. It shows the amount of net carbs automatically. This free PDF is very basic, but it covers most popular foods, listing amounts in servings. If you prefer books, there are several great pocket guides to carbs: CalorieKing Counter or The Ultimate Carb Counter. If you are on a ketogenic low-carb plan of 20-30g a day, every single gram matters. So net carbs vs total carbs distinction becomes important. Some carbohydrates – mostly fibre and sugar alcohols (polyols) – are not digestible. Although you are technically consuming carbs, your body doesn’t absorb them. So there is no need to count them. Digestible carbs are referred to as “net carbs”. Depending on where you are in the world, you may need to subtract the fibre number from the total carbs to get the net carbs. Food labelling laws vary by country. Carbohydrates information is presented differently in the USA and the rest of the world. But this net carbs formula does not work for Europe, Australia and Oceania. In those parts of the world, total carbohydrate numbers on packaging show digestible carbs only. The fibre count has already been excluded. If you use the American formula, you will subtract the fibre twice. Your net carbs count will be incorrect – lower than the real one. If you are American, watch out for this issue when using recipes from cookbooks or websites in a different region. It’s fantastic that we can share recipes with each other across regional boundaries. Just remember to double-check your net carbs. 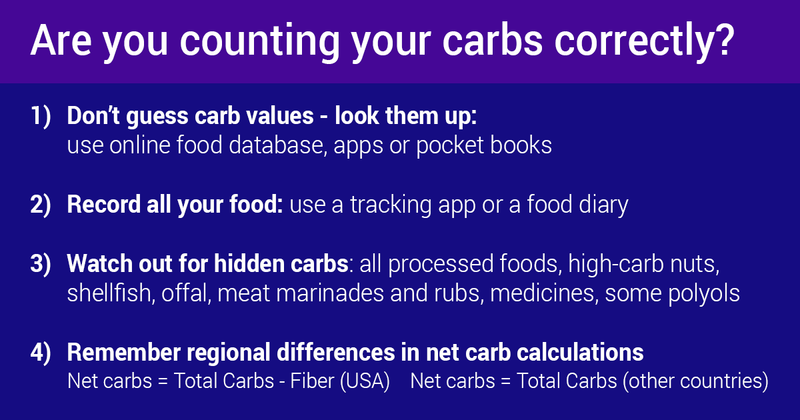 The easiest way to track and count your carbs is to use an app. Tracking apps come with an in-built food database, so you don’t have to look up nutritional data separately. Just add everything you eat to your app diary. It will calculate your carbs and other macros for you. MyFitnessPal is a great app that would be suitable for non-ketogenic low-carb diets. Unfortunately, it is not optimal for calculating net carbs. Although their database includes this field, their data is not always accurate. Entries from the USA and Europe are mixed together, which messes up the net carbs counts. So if you are on a ketogenic diet, it wouldn’t be completely reliable. FatSecret is another popular food diary app. It has different regional versions so is more accurate for counting net carbs. You can also use a specialised app that was created with a low-carb diet in mind, such as KetoDietApp, CarbManager or Atkins Diet app (USA only). Hidden carbs are cunning and often show up where you least expect them. Almost all ready-made foods have added sugar or flour. This includes processed meat products like supermarket sausages and burgers. They are often stuffed with breadcrumbs and potato starch. Sauces like ketchup, Caesar dressing or vinaigrette usually contain sugar. We often discount these as negligible, but even a few teaspoons can mess up your carb count. Some meat and poultry come with a pre-made marinade, like BBQ sauce. You might think you are safe since you are just buying a chunk of meat. But it has been bathed in carbs! Most nuts are low in carbs but there are several exceptions, for example, chestnuts, cashews and pistachios . Fish, like most other animal proteins, is zero carb. Shellfish is not. Whelk (sea snail), mussels, oysters, scallops and squid all have a few carbs in them. Offal meat like liver or kidneys is extremely nutritious, but it does contain a few carbs. Watch out for meat pates too, as they are often made from liver. Some over-the-counter remedies are loaded with sugar. Cough syrups and sore throat lozenges are basically sweets with a little bit of active ingredient added. Best of luck with your low-carb diet! Just came across your website, fascinating amount of information available, thank you very much. Further to a previous comment I also discovered Cavalier Chocolate bars (see below) however, I am unsure how to work out the net carbs. Because the sweeteners are erythritol (polyols) and stevia can I subtract some of the sugars from the carb figure as they are naturally occurring or only subtract the polyols ?? cocoa butter, full milk powder, alimentary fibres (dextrin, inulin, oligo fructose), whey powder, sweeteners (erythritol, steviol glycosides), skimmed milk powder, freeze dried mango powder (4,6%), freeze dried raspberries (2,7%), emulsifier: soy lecithin, natural flavours. Cocoa solids: minimum 44%, milk solids: minimum 40%. Contains naturally occurring sugars. Cavalier is a really good brand because they use erythritol – the only polyol that’s genuinely zero-carb. So yes, you could subtract it from the total carb count. That’s not too bad. But check out Cavalier dark chocolate bars – they are lower in net carbs as they don’t have any added dried fruit.